Fitz-Thors Engineering - News - Blog - Birmingham, AL — Fitz-Thors Engineering, Inc.
Fitz-Thors engineer, Matt Moody, test drives the University of Alabama's 2017 FSAE car. Getting to test drive these Formula SAE race cars, designed and built by engineering students, is a privilege we enjoy each year as a sponsor of the University of Alabama’s Crimson Racing Team. On October 28th we had a chance to get behind the wheel of the 2017 car. Crimson Racing is a student design team within the University of Alabama’s Mechanical Engineering Department. The team works to design, build, and manufacture a formula style race car that competes annually in the Society of Automotive Engineers’ (SAE) Formula racing competitions. The program focuses on exposing students to a businesslike environment in the design and manufacturing of a production vehicle. A long time sponsor of Crimson Racing, Fitz-Thors traces its own origins back to the program. Company founders Matt Fitzgerald and Arnar Thors were first acquainted when they signed up to join the team as engineering students. “This is a program that provides real-world experience like no other. Having gone through it ourselves, we know that anyone who comes through this program will possesss invaluable, real-world, professional engineering skills like managing time, money, people while also making a great product. We like to recruit from this program, because we know people on this team can balance their engineering skillsets with project management just like we do everyday at our company,” Fitzgerald said. The students learn how to interact in a company atmosphere in order to meet deadlines while collaborating with other students. The competition requires the students to not only design and build a car, but also try to sell the car as if it were a real production vehicle. Zach Froehlich is a Crimson Racing team member who also works at Fitz-Thors as part of university’s co-op program. The program allows students like Zach to maintain full-time student status while gaining work experience pertinent to their field of study. When not focused on his general coursework or his brake designer duties with the FSAE team, Zach is doing real engineering work at Fitz-Thors contributing to customer projects. This involves problem-solving, and designing parts in CAD, operating machinery and assisting with builds and installations. "Okay, take 'er easy now." Long time Fitz-Thors employee and Crimson Racing alum, Matt Moody, was on hand for the Sponsor Drive Day on October 28th. Matt got behind the wheel of the Crimson Racing 2017 (CR17) car that competed in the May race in Michigan. Winners are not crowned simply based on which car gets the checkered flag. Rather, an 1000 point cumulative score is maintained during the year that is based on both static and dynamic aspects of the build project. Static aspects include engineering, cost analysis, and business presentation. Dynamic aspects include acceleration and fuel economy. Fitz-Thors, a Crimson Racing sponsor for over ten years, also sponsors the FSAE team in Auburn. There is competition between the two schools as you’d expect, but also an open dialogue and healthy collaboration between them. With heavy prevalence in Alabama, the automotive industry is at the root of many of Fitz-Thors' clients and projects. The company designs and installs a lot of the production line equipment that goes into assembling of the vehicles we all drive. The founders and many employees are self-professed “car guys,” and the company also sponsors other collegiate design racing teams. In addition to the two FSAE programs, Fitz-Thors is a sponsor of the Baja SAE and EcoCAR 3 programs at Alabama. FSAE team members give a design brief to sponsors, discussing frame, suspension, powertrain, and electrical. The Crimson Racing team competes annually at Michigan International Speedway in the Formula SAE competition. Held May 10-13 the event hosted 120 teams from around the world. In the past four years, Crimson Racing has improved from 98th place to 17th place in the rankings. 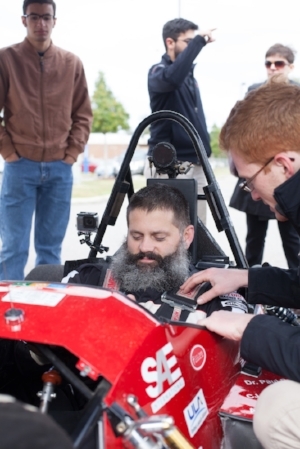 Stronger than ever in the history of the program, the team also aims to compete in the Formula SAE Lincoln competition for the first time in nearly a decade. This year Crimson Racing was one of 10 team selected from around the country to be awarded a Bosch Sponsorship based on the past progress of the team’s powertrain and their projected plans for improvement this year. As a reward, the team will receive Bosch sensors and electronics to use in their 2018 car. Bosch is a multi-national engineering company that is the world's largest producer of automotive parts. FSAE considers this a huge win for their program and a great testament to their powertrain team’s passion for research and growth. “The FSAE program brought to life many of the engineering concepts from the classroom and helped build a background of hands-on skills like machining and welding. Having the ability to manufacture your idea for a solution really empowers you as an engineer and creator. It also totally changes your approach as an engineer when you learn the many lessons from building your own designs. Looking great on paper doesn’t directly translate to a great functional design,” says Fitzgerald who largely credits his experience in the program to the success of his company today. “Whether it’s race cars or robots, at the end of the day we are about designing and building something new and innovative. Always learning and taking on new challenges – that’s what drives us and our team." Fitz-Thors visited the The University of Alabama's campus in Tuscaloosa for this fall’s "Coming in Clutch" sponsor social, which celebrated the UA EcoCAR 3 Team’s fourth competition year and its contributors who make the project possible. EcoCAR 3 is an advanced vehicle technology competition that gives 16 collegiate teams four years to turn a Chevrolet Camaro into the ultimate energy efficient, high-performance vehicle. Fitz-Thors’ support of EcoCAR 3 reinforces its commitment to supporting higher education, expanding experiential learning programs and providing resources for the next generation of automotive leaders. The sponsor social began the afternoon of Nov. 17 with a tour of the College of Communication and Information Sciences, followed by lunch and a project status update. Attendees then toured the EcoCAR 3 garage and had the chance to take their first ride in the team’s plug-in hybrid-electric Camaro. Fitz-Thors was able to see where its contributions were being put into effect, as well as ask questions about the team’s student-designed vehicle architecture and technical specifications. EcoCAR 3 provides hands-on training and experience to Alabama students that is equivalent to three-to-five years of industry employment. Over the past three years, 94 percent of the team’s 69 graduates have found full-time employment, and 75 percent of team members secured a co-op or internship while on the team. Not only is EcoCAR 3 helping Alabama seed the automotive industry with talented professionals, but it is also educating Alabama citizens about the importance of sustainable engineering and S.T.E.M. education. Through community outreach programs and social media platforms, UA EcoCAR 3 has educated over 9,000 Alabama citizens on sustainable practices that will maintain Alabama’s natural beauty for future generations. Multiple youth outreach programs, like UA’s summer diversity program and EcoScholars program for middle school students, have informed students about the importance and accessibility of S.T.E.M. education and careers. “EcoCAR 3 not only educates our students and citizens, but it also impacts our students by creating a community of camaraderie and teaching that is irreplaceable during their time at The University of Alabama,” EcoCAR 3 faculty advisor, Dr. Paul Puzinauskas, said. About Fitz-Thors Engineering, Inc. Our company specializes in design-build engineering projects and high-precision manufacturing services. Founded in 2007, we serve customers needing complex solutions and equipment, designed and custom-built for their specific business objective. Solutions range from small specialized tooling needs, to large-scale, full assembly and production line builds. Projects typically support or establish a manufacturing process and involve engineering design, concept simulation & prototyping, machining & fabrication, automation & programming, finishing with implementation, and installation. When manufacturers need to ramp up or stay competitive in their markets, we design solutions to maximize efficiency and quality, while improving safety for employees. Additionally, if someone has an idea for a new product or technology, we can help design, prototype, and refine the concept into a finished product, ready to go to market. Our goal every day is to add value through engineering design and manufacturing expertise, with a focus on solving problems and bringing ideas to reality. Made up of a broad and expanding range of industries, our clients share a need to maximize processes through superior efficiency. Our clients include companies in the automotive, food & beverage, pharmaceutical, steel manufacturing, medical technologies, and product development markets. 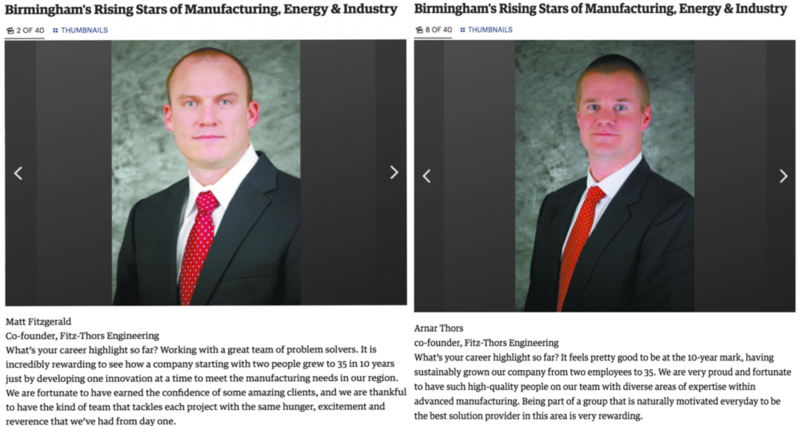 Founded in 2007 by Matt Fitzgerald and Arnar Thors, Fitz-Thors Engineering celebrated its 10 year anniversary last month. The company has grown to 35 employees by consistently meeting automation, manufacturing, and product design needs in the region. By delivering custom solutions, Fitz-Thors helps clients achieve maximum productivity for their manufacturing goals. What's your career highlight so far? ARNAR THORS: "It feels pretty good to be at the 10 year mark, having sustainably grown our company from 2 employees to 35. We are very proud and fortunate to have such high quality people on our team with diverse areas of expertise within advanced manufacturing. Being part of a group that is naturally motivated everyday to be the best solution provider in this area is very rewarding." Where do you hope to be in five years? MATT FITZGERALD: "We’ll be in our new facility (Hardware Park) in downtown Birmingham, hopefully continuing to find needs that our team can fill in design and manufacturing of new technologies. From our new location, we hope to become more plugged into the technology community, while helping push Birmingham forward." © 2019 Fitz-Thors Engineering, Inc. All Rights Reserved.